International freight forwarding and logistics company Panalpina is to acquire a majority stake in Airflo, a company based in Kenya and the Netherlands specialized in the export handling of flowers and vegetables. 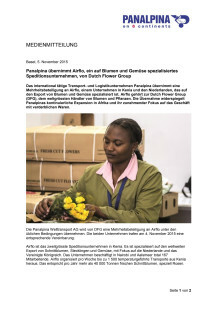 Airflo is part of Dutch Flower Group (DFG), the world’s largest flower and plant trader. The acquisition reflects Panalpina’s continued expansion in Africa and its increasing focus on the perishables business. Panalpina World Transport (Holding) Ltd. will acquire a majority stake in Airflo from DFG, subject to conditions. The two companies reached a respective agreement on November 4, 2015. Airflo is Kenya’s second largest air freight forwarder, specializing in the world-wide export of fresh cut flowers, plant cuttings and vegetables, with a focus to the Netherlands and the UK. The company employs a total of 167 staff in Nairobi and Aalsmeer. It organizes up to 1,500 temperature-controlled shipments per week from Kenya, totalling more than 40,000 tons of fresh cut flowers, especially roses, each year. 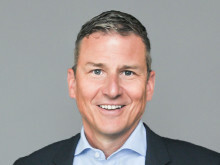 “The acquisition of Airflo further expands our presence in Africa and makes us an important player in the Kenyan flower market,” says Peter Ulber, Panalpina’s CEO. 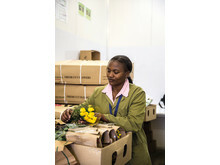 Kenya, where Panalpina set up its own operations at the beginning of the year, is one of the world’s key export markets for food and floral products. 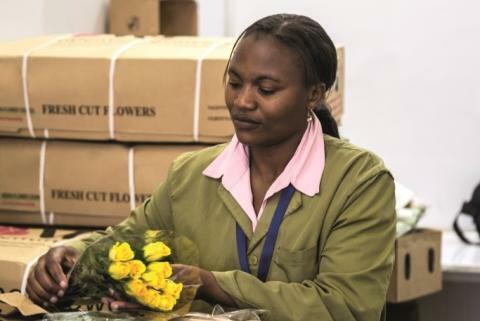 Fresh cut flowers accounted for more than 60% of Kenya’s total air freight exports in 2014. Airflo’s services in Kenya include quality control after products have been delivered to its Nairobi warehouse by growers, palletizing and delivery of the secured goods ready-for-transport to the ground handling agent at Jomo Kenyatta International Airport. This all happens in a temperature-controlled environment, including the use of a vacuum cooler to cool fresh cut flowers down to 4 °C in a matter of minutes. Airflo coordinates its shipments with the airlines, takes care of customs clearance at Amsterdam Airport Schiphol and onward distribution. DFG and Panalpina have agreed not to disclose any financial details of the deal. The acquisition is subject to approvals by the Kenyan and Dutch authorities.